A Mr. Simms Candy Shop opened on our high street a few weeks ago. Mr. Simms, I am told, is a franchise that has a fair number of stores up north and they are now beginning to extend into the south. Mr. Simms didn’t come for the grand opening, or maybe he did—it would have been hard to tell with all those people packed into the shop. 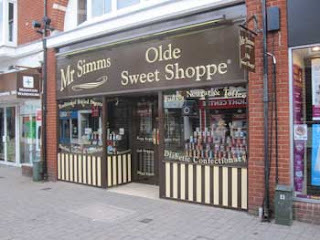 This candy store is off to a good start, thanks to their winning formula: go into any Mr. Simms shop and listen to the people as the peruse the shelves and counters and you’ll understand that they are not selling confections so much as they are selling memories. Smarties, but not as we know them. The candy hasn’t changed—it’s still just sugar and it’s still as bad for your teeth—but the perspective has shifted. I dare say, with our adult palettes now attuned to fine wine and haute cuisine (or at least a bucket of the Colonel’s best on a Sunday afternoon) the candy probably doesn’t even taste as good as it used to, but the nostalgia value is hard to put a price on. Except for one item: the candy ciga...um, I mean, crayons. 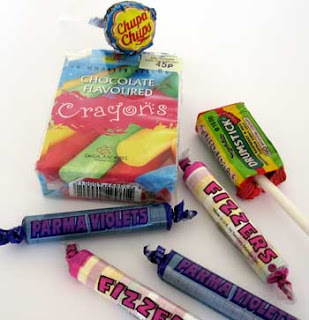 Remember them, the hard white sticks made of sugar with one end tinted pink? We used to think we were so sophisticated, sucking on a make-believe cig…I mean, crayon, just like our dad, or mom, or mom’s new boyfriend. I’m glad they kept the candy, and I understand the need for caution, but really, who do they think they’re fooling? 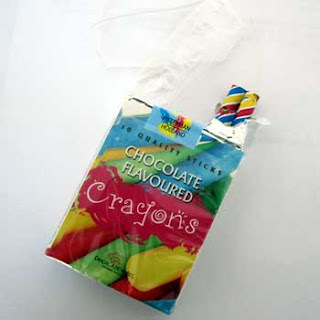 Every school kid knows what comes in a cellophane wrapped, soft pack that you get into by peeling the top off of and shaking a few out. Crayons, right? OK, these are chocolate, but you know the kind I mean. The least they could have done was use the Marlboro hard pack that opens at the top; that would look more like a box of crayons and less like what your dad keeps stashed in his coat pocket along with his Bic lighter and house keys. Repackaged cig…I mean, crayons, notwithstanding, I had a nice visit with Mr. Simms’ southern elves. It was doubly fun for me because I got to play the “what American candy does this remind you of?” game. I was pleased to see they had Smarties, and Sweet Tarts, though they called the Smarties “Fizzers” and the Sweet Tarts “Refreshers” and had to explain to me that British Smarties were similar to American M&Ms but without the “M” on them. And none of the candy tasted like American candy (the Fizzers, appropriately enough, fizzed). It was all too confusing. And they didn’t even have paper dots. I expect I’ll make good use of the store; I have a grandchild on the way and I want him (fingers crossed) to grow up multi-cultural so we will, no doubt, be shipping bags of the stuff over for Christmas, Easter and birthdays. And if my grandson grows up thinking that British children smoke crayons and colo(u)r with cigarettes, well, you can blamed the confection constables. Allow me to disclose this: I may be an American, but I’m not residing in their jurisdiction so I don’t have to disclose a thing. HA HA HA HA HA HA HA. Do you know what Mr. Simms gave me for the above, glowing review? Nothing. Not even a free Ju-Ju Bee or a packet of Twizzlers! No matter; I don’t do this for gain; if I did, I would have quit long ago. I must say that one of my favorite things to do in foreign countries is to visit the candy shops as there are always so many new and different things. The UK ones are no different. I send my British boyfriend care packages every few weeks and always include new and fun American candies. We always have fun chatting about the possible British version. I still don't understand why people can't spell shop correctly in England instead of some sort of made up facia...is it for the benefit of he tourists? Did they have liquorice allsorts? Ooh, memories. Did you know that candy, I mean, sweets, were often marketed in the north east of England first. Kind of like a white trash thing - (I'm from there, so don't get all bent out of shape at me) - but the theory was that if they didn't sell in the north east, they wouldn't sell anywhere. I actually remember boxes of Crackerjack as a child but none of my southern university friends had ever seen them. Drew: At least it's not "Ye Olde Sweet Shoppe"
Expat Mum: are UK Crackerjacks the same as US Crackerjacks? bought violet candies recently only to discover that they tasted like a dryer sheet. did they taste better forty years ago...don't remember. Smitten: Ah, Cracker Barrel...another thing I miss about the US.